All about your 8-month-old baby! Physical development: Baby will rake objects to himself with his hands. He’s also learning how to feed himself, says Dr. Mollie Greves Grow of Seattle Children's. He is likely transferring objects from one hand to another. He’s becoming more mobile and may be crawling already. Brain development: Baby is more aware of her environment and the people in it, says Grow. "An 8-month-old is curious about everything, but he also has a very short attention span and will move rapidly from one activity to the next. Two to three minutes is the most he’ll spend with a single toy, and then he’ll turn to something new," according to healthychildren.org. Social development: He’s becoming more alert to strangers, says Grow. Baby’s beginning to express some hesitancy with people he doesn’t know, a wariness of strangers that will persist typically through age 2. Baby might become very upset when Mom, Dad or primary caregivers leave. What to watch for/common concerns: Mobility brings with it many more concerns for safety in baby’s environment, says Grow. Baby can reach more things and can get to objects more quickly, so stay one step ahead of him. Around this time, some babies become wary of strangers. Your baby might resist staying with anyone other than you, shunning grandparents or friends, according to the Mayo Clinic. Most often, baby will stop fussing once you are out of sight. 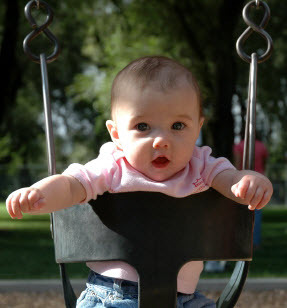 One important thing you can do for your baby: Baby needs a safe environment. Childproof your home paying special attention to everything within reach — three feet high and under — including electrical outlets, small objects and toys, cords, hot water sources and others, says Grow. More information on child-proofing your home for baby here and here.